Board games use the theme of trains often. From Ticket to Ride to Steam, riding the rails or building a rail empire bring gamers to the table often. 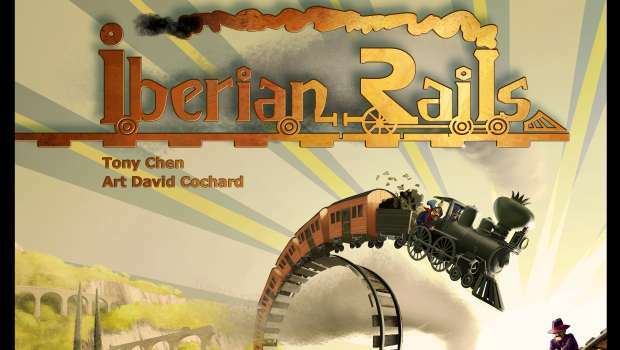 Now Iberian Rails is set to take on the train genre with its current Kickstarter campaign. To find out more I asked eight questions to designer Tony Chen. Who are you and what is your background in gaming? I started playing modern board games around 2006, after discovering boardgamegeek and a game club called Berkeley Board Gamers. Ten years later, I am still playing. Where did the idea for Iberian Rails come from? From playing a lot of Imperial, Chicago Express, and believe it or not, Modern Art. In order to become better at these games, I analyzed them and realized that they can all be broken down into a system of cash flow revolving around three essential steps: share acquisition, value adjustment, and payout. Each game combines the three steps slightly differently. For example, Imperial has two kinds of payouts: payout to the country (Taxation), and payout to the player (Investor). The value adjustment affects only payout to the country during the game, and does not affect payout to the player until the end of the game. Modern Art combines share acquisition and value adjustment together (each painting sold affects its value! ), etc. I studied the nuances of these different cash flow systems in order to understand how to use them to my advantage in games. In the process, I learned that subtle differences can have a huge impact on gameplay! So I started thinking of other ways to structure cash flows. Iberian Rails is an implementation of one of those ideas. Why set the game in Spain? I visited Spain in late 2011 and loved it. When I started developing the game in early 2012, Spain was fresh on my mind. What does Iberian Rails do that differentiates it from other train games? The most obvious one is the character row. The use of characters in a train game is novel in itself. Moreover, the process of selecting these characters uses an original mechanism we came up with. In short, the order of the characters in the character row affects what players can select from round to round. Since the order of characters in the character row is determined randomly at setup, each game offers a different set of strategies. What works one game (Bureaucrat into Engineer combo, for example), might not work in another due to the different positions the characters take in the character row. In another example, when the Mafioso is near the front of the character row, there tends to be more sabotage going on. Another difference is how the companies are characterized by the number of shares that they have. The fewer shares a company has, the quicker investors can get return on their shares. However, companies with more shares tend to grow for longer. This is all due to the unique cash flow system of Iberian Rails. Where did you come up with the idea of companies taking turns in a specific order instead of the players? I gave it away above. Basically Imperial. Also, given the nature of the cash flow system I used for Iberian Rails, company-based turns makes a lot more sense. Why include both open and closed auctions in Iberian Rails instead of specifying a particular one? To give the players a choice between boosting the long term growth of his company, or cashing out now. This is a very important decision in the game, actually. The better choice depends on the situation and how the player uses it. By the way, if you think about it, the closed auction is similar to a Modern Art auction: one player pays another player for a share. How many characters are included and what do they do? The base game comes with ten characters. Right now, four additional characters are included from unlocked stretch goals, for a total of fourteen characters. A potential of five more characters may be unlocked, which will bring the total to nineteen characters. We are adding a lot of gameplay content in our Kickstarter campaign through stretch goals. The characters come in to help the players take their turns as CEOs. For example, if I chose the Engineer this round, then all my companies can build tracks using the construction cost of the Engineer. The characters have different construction costs, and some characters can’t even build tracks. Some characters can hold an open auction, some can hold a closed auction, some both, and some neither. Many characters also have special abilities. Do you have plans for more maps and characters or other expansions if Iberian Rails is successful? Yes, but none are being tested right now. The characters that would have been in an expansion are already available as stretch goals, and the board is already double sided with two maps. However, if Iberian Rails is very successful, we will consider designing more; but that will take time because we spend a lot of time testing our designs. Want to know more? Look at their Kickstarter for more information. At this time there’s ten days left to back it!